Small multi-purpose vehicles are big business in Europe. With a hoard of MPV options available on the market, Kia is injecting some style into its latest MPV creation to stand out from the crowd. Set to be full revealed at the Geneva auto show, the No 3 concept car has a windshield that extends up over the driver. A glass panoramic roof covers the remainder of the cabin. A diagonal support that runs from the passenger side A-pillar to the driver’s side B-pillar is the only thing interrupting the otherwise clear canopy. In addition, a character line runs from the front wheel wells back, and pronounced wheel arches are borrowed from the Soul. 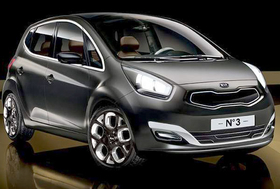 Up front, the No 3 wears a new company face with a large stylish grille with the Kia logo affixed above it and stretched-back headlamps. Look for the No 3 concept to serve as a basis for a production MPV from Kia in the future.